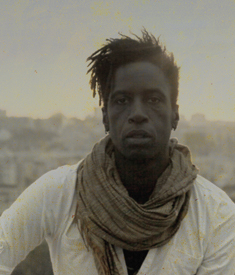 A leading voice on the spoken-word scene, Saul Williams began astonishing open mic audiences with his impassioned tongue-twisting verse in the mid-1990s and eventually became a grand slam champion at the Nuyorican Poets Cafe. In 1996, he led the four-person New York team to the finals of the National Poetry Slam competition, a fierce battle of verse that was chronicled in the documentary film Slamnation. Two years later, in a role that featured many of his own compositions, Williams played an imprisoned street poet in the award-winning film, Slam, for which Esquire magazine deemed him a "dreadlocked dervish of words." A self-proclaimed disciple of Bob Kaufman and Amiri Baraka, Williams combines the rhythms and themes of Beat and Black Arts poets in his work. His three collections of poetry--The Seventh Octave, Sãhe, and , said the shotgun to the head--tackle difficult social and political issues as well as intangible questions about religion and spirituality. In performance, his work is full of a pulsing frenzy, which the New York Times described as "mind-twisting cosmic rumination with hallucinatory science-fiction scenarios that the poet delivers with an incantatory fervor."